1988-1998 Dodge 5.9L Cummins 12V - Turbo Mount / Vacuum Actuated. Avoid costly repairs from brake system damage from descending grades with a load with the BD Exhaust Brake. BD’s exclusive Variable Butterfly Technology provides peak retarding power throughout the engine’s RPM range to help slow your rig down safely. 1998.5-2002 Dodge 5.9L Cummins 24V - Turbo Mount / Vacuum Actuated. 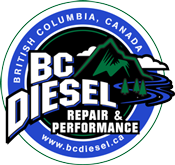 Avoid costly repairs from brake system damage from descending grades with a load with the BD Exhaust Brake. BD’s exclusive Variable Butterfly Technology provides peak retarding power throughout the engine’s RPM range to help slow your rig down safely. 2013-2019 Dodge 6.7L Cummins - For trucks that have an aftermarket non-VGT turbocharger in their Cummins, you can now enjoy BD's legendary mechanical butterfly valve exhaust brake. Provides up to 150 retarding HP throughout the engine's RPM range. Cannot use factory VGT turbo! 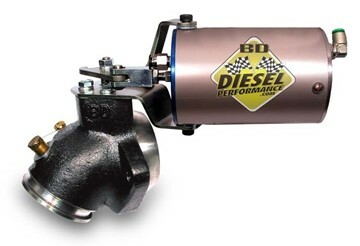 BD Diesel's Air Actuated Exhaust Brake kit for your 1999-2002 Ford Powerstroke 7.3L diesel. Comes with an air compressor kit. Mounts remote on your exhaust system for applications with aftermarket turbochargers. BD's brand new variable butterfly valve exhaust brake & air compressor kit for your 2011-2016 Ford 6.7L Powerstroke diesel pickup. This kit replaces the exhaust brake function if you have installed an aftermarket turbocharger such as the BD scorpion kit.